This recipe is a vegan adaption of the Chicken Cacciatore recipe posted on Joann’s food for thought. I thought I would try to make it vegan by using lima beans instead. I think that Joann’s recipe is the best chicken cacciatore recipe I have seen. So, please check out her blog. The name of the recipe is courtesy of my husband. He is a very talented writer, and I thought it was catchy. I relied on Google translate so I am not sure how grammatically correct it is. Please let me know if it is not. 1 teaspoon of Italian spice blend, oregano, basil, pepper, turmeric. The turmeric is what gives it such a great color. This is Joann’s unique contribution. Sauté in pot onions, and peppers. Add beans, canned tomatoes, water and spices. I made this in the pressure cooker. 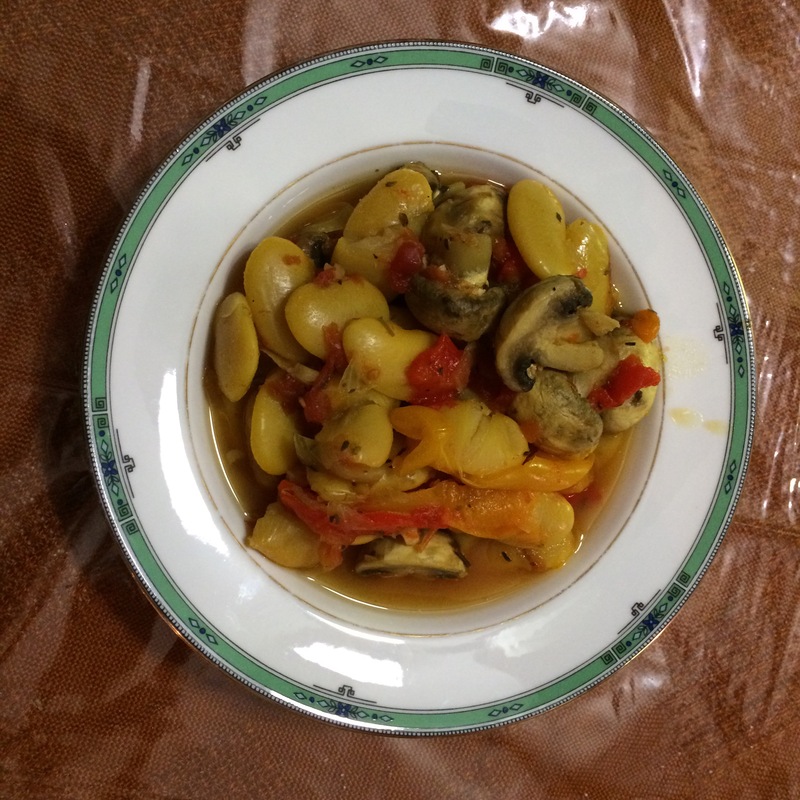 Lima beans really need 15 minutes to pressure, but I didn’t want to overcook the mushrooms. So, I brought it to pressure and cooked everything for only 12 minutes. Then, I released the pressure using quick release method and added the mushrooms. Then, I simmered it until done. Adjust the seasoning once it is cooked. In a real rush, I think I would cook it for 15 minutes to pressure and then let the mushrooms cook in the pot from the heat. This could be made on top of the stove, or in a crockpot. My husband, a true carnivore, said this was great! I’m a carnivore too, but I’d be happy with this Lima bean dish. It is a perfect vegan alternative for someone who is really a carnivore. It came out great! A keeper. I think so looks amazing! Now, Hunters’ Lima Beans makes more sense. You are a true wordsmith! Still, my husband’s is kind of funny.